We strive to bring you the best in quality, value and selection. 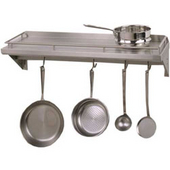 Browse our collection of pot racks from top of the line manufacturers. 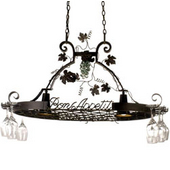 These stylish pot racks adorn every kitchen with a beauty that is unique and elegant. 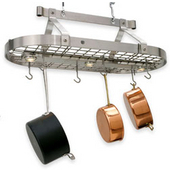 This vast selection of pot racks is available in wrought iron, wood, stainless steel, brass, chrome and much more, creating endless possibilities for any kitchen. 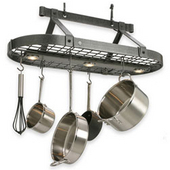 A combination of fashion and function, these pot racks allow you to display and store your cookware neatly. 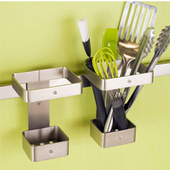 Available for your ceiling or wall, each is as convenient as the next. 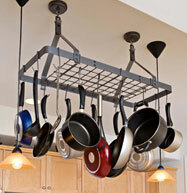 Move your cookware out of the back-bending lower cabinets to just an arm's reach away. 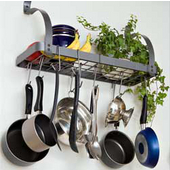 With a great variety of styles, sizes and finishes, these pot racks are an innovative way to create the kitchen of your dreams. 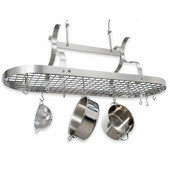 Enclume "Rack It Up" Pot Racks are affordable and are available in various shapes and sizes. 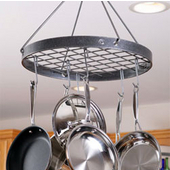 Featuring super-strong new technology Drywall, these pot racks will hold hundreds of pounds while remaining light enough for easy installation. 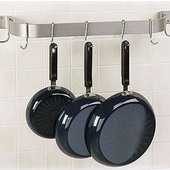 The pot racks make the ideal focal point in any kitchen with their traditional yet modern look and feel.